While both Buffy and Angel had single 'stars', the real strength of the show was that they were really ensemble shows at heart. Both had tremendously strong supporting casts, with a Scooby Gang backing up the main star. On Angel, one of those Scoobies was Fred. During the last few episodes of season 2, Angel and the gang found themselves in an alternate dimension - Pylea. There they find a young woman who had been sucked into the dimension earlier, and was barely holding on to her sanity. She was brilliant, but a serious freak at this point. Fred traveled back with Angel when he and Cordelia, Gunn and Lorne managed to figure out the return trip. She then became a regular part of the gang, helping the group with the more mental challenges, throughout the rest of the series. In the final season, season 5, Fred was infected by an ancient demon named Illyria. She completely takes over Fred, and Fred takes on a very attractive blue hue. 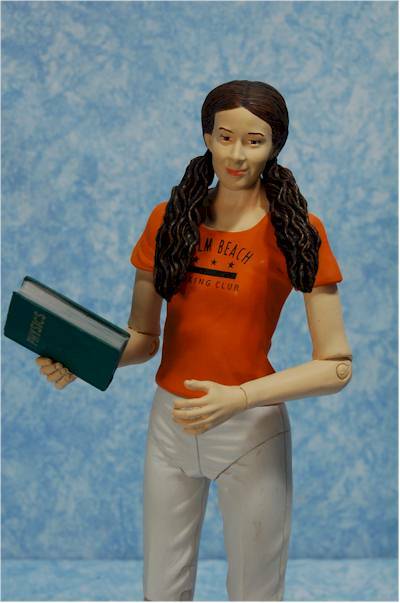 Tonight's review covers two new figures from DST in their Angel series - Fred from season 3, and Fred as Illyria. These aren't hitting stores quite yet, but should be within the next couple weeks or so. The Illyria shown here - the "Shells" version from the episode of the same name - is a shortpack. There is a second version of Illyria, from her true first appearance in A Hole in the World, which is a Previews exclusive. 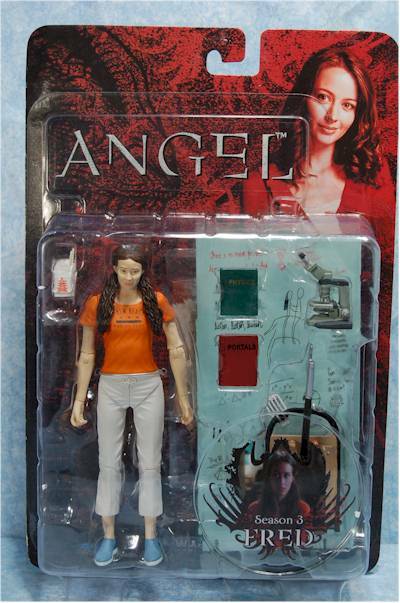 This is the same packaging as the rest of the Angel line, but it's nicely personalized for Fred, with her photo on the front and some basic info. I like the color choices and overall style, although it will be tough for MOCers to store due to the large bubbles. There is no wasted space though, since these come with a ton of accessories. 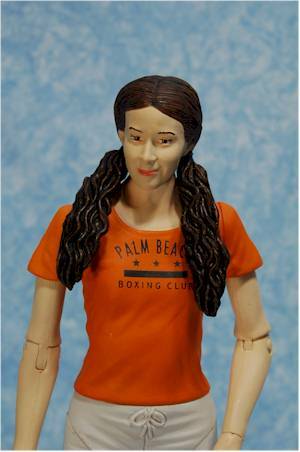 Amy Acker plays Fred and Illyria, and like many pretty women, she's tough to sculpt. Her face has very little 'personality', very little in the way of oversized or odd appearing features that the sculpture can use to their advantage. Instead, it's all about getting exactly the right proportions between chin, nose, eyes, etc, and capturing just the right expression to allow her quirky personality to shine through. In this case, they did a better job with Illyria than Fred. Fred is close, and she's cute, but the large pony tails don't quite work, and the smiling expression just misses the mark. The more serious expression for Illyria - who always had a kind of a blank expression - works much better, and the very lack of expression allows the accuracy of the facial sculpt to show through. I like the body sculpts on both these figures, and while I'm not keen on the pony tails, I do like the longer, softer hair on Illyria. It doesn't interfere with the neck articulation as much as you might think, and the softer rubber looks good as well. The hand sculpts both allow for the figures to hold their accessories (at least some of them), and both figures stand great on their own. These figures stand just over 6" tall, about a quarter inch shorter than Angel from the same series. She's a little too tall, but at least she's not exactly the same size. The paint ops on both figures are solid, but this time Fred manages to squeak past Illyria. The small detail work is good on both, but Fred's logo shirt looks excellent. The colors that cover large areas are nice and consistent, and there's very little glopping with the skin tones. Fred has better eye work than Illyria though, who appears to have one slightly lazy eye. The blue on the arms and legs of Illyria doesn't quite translate either, and there's a bit more slop with its application. Both figures have the usual Buffy/Angel non-deluxe figure articulation. There's ball jointed necks (yea! ), cut shoulders, cut biceps, pin elbows and knees, cut wrists and ankles, and waist. Fred has a V crotch, while Illyria has cut joints at the top of her legs under the dress. Even though Fred and Illyria both have long hair, the ball jointed neck still has a pretty good range of movement. While the leg articulation is really just there to allow you to get them standing perfectly, the arm articulation is very useful in conjunction with the myriad accessories. Here's were both figures really shine. The Angel and Buffy lines are starting to really hit on the accessory category, and this pair has some great stuff with less reuse. Fred has two books - one on Physics and one on Portals. I'm sure you could find the second one at your local library. 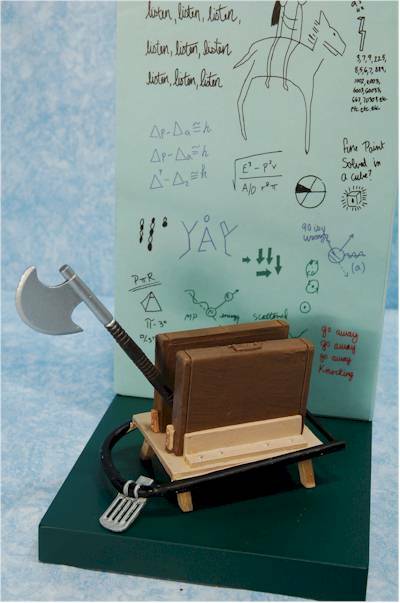 She also has a very cool microscope, with some great sculpt and paint detail work, a box of Chinese takeout food, and an axe throwing machine. When they do episode specific accessories like that, they really hook me. She also has a chunk of the hotel room wall that Fred was scribbling on, during her weirded out period after coming back from Pylea. The writing is done on a sticker applied to the plastic wall, but the sticker was nice and smooth on mine. 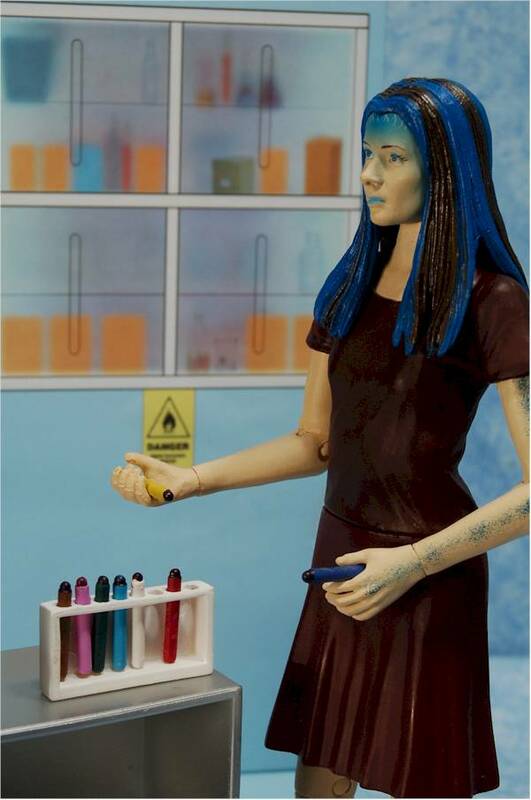 Illyria does come with the same microscope, but that's the only pure reuse. She also has a chunk of all and floor, but this time the sticker is of a bank of shelves containing lab equipment, right out of the Wolfram and Hart lab. 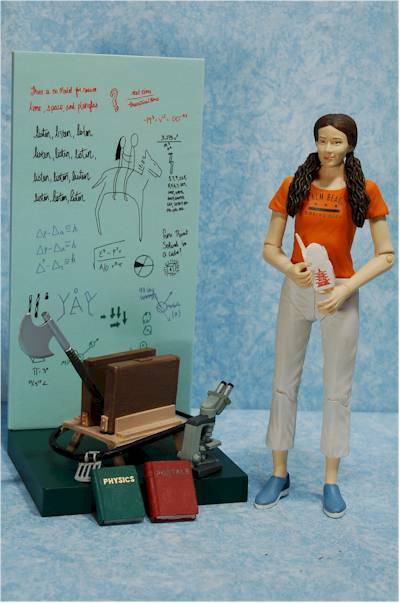 She also has a book shelf, rack of multi-colored test tubes (all removable), and the Feigenbaum stuffed bunny rabbit. (Feigenbaum is considered by many the father of chaos mathematics). The various accessories we've been getting with the more recent Angel and Buffy figures are really starting to come together, and make for some great display potential when combined. The reasonable articulation, sturdy joints, and good balance combine with the really nifty accessories to make these toys fun for kids of all ages. While they'll end up in the hands of collectors predominately, kids would find them just as fun. If you pay around $12 for these, you're getting a solid value. They are coming in on the lower side of the usual specialty market price, and yet have plenty of articulation and accessories to go around. Paint ops tend to be the thing most mentioned, and it's true here too. I got a pretty good pair, but you do want to watch for those lazy eyes if possible. There's a more important issue here though. There is tape holding the background pieces in the trays. On my Shells Illyria, this tape ran over onto the front of the sticker, and when I tried to remove it, damaged the sticker. Be extra careful, and watch with either figure, since it is theoretically possible that the person taping things up could get the tape across either sticker. 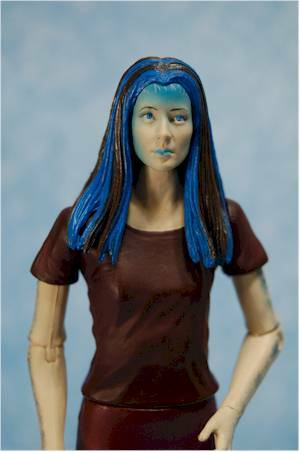 Amy Acker is definitely an actress that's tough for any sculptor to capture, but they did a reasonable job, particularly with Illyria. Fred isn't quite as good when it comes to her sculpt, but her paint, articulation and accessories make up for the shortcomings. This pair will fit in great with the rest of the Angel line, and I'm very impressed with the thought that's going into the accessories. There are five Angels coming out as part of this same wave, and I'll have a review of them up (you can see season 5 Angel in one of these photos) later this week. 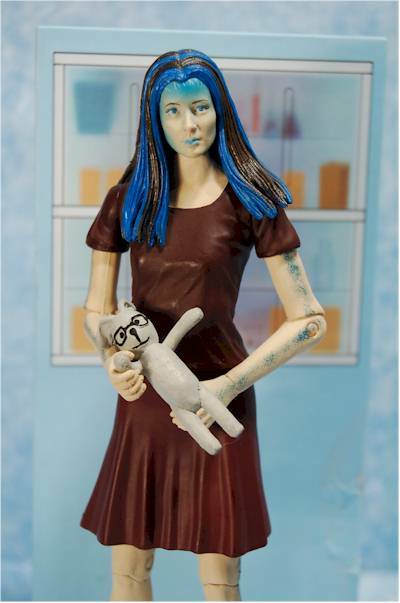 - Amazing Toyz has the Shells Illyria for $25, or the regular Previews Illyria for $12. They also have Fred for $12. 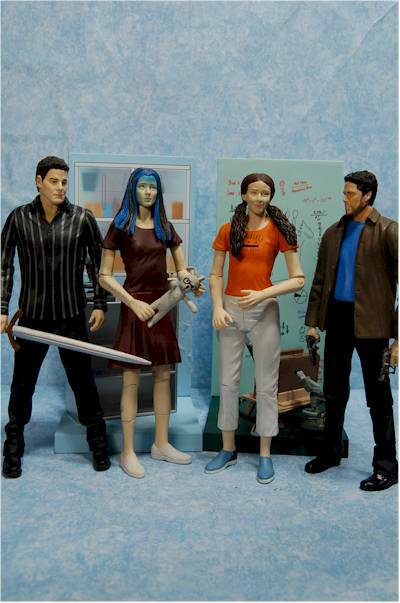 - the Buffy Collectors Club has the previews Illyria for $12, or you can get a great set of the Fred, Shells Illyria, and Season 5 Angel for $36. That's the best deal around for the Shells version I've seen. - CornerStoreComics has the previews Illyria or Fred for $12, or the Shells Illyria for $25. - Alter Ego has the previews exclusive version of Illyria for $12.75. - Circle Red has the previews version of Illyria for $13, or the pair of Fred and Angel for $24. - Time and Space Toys has the previews Illyria for $15, and if you buy a $100 gift certificate, you can get the Shells Illyria free. - Yikes Comics has Fred and Angel together for $25. - here's the Deluxe super articulated Buffy and Faith figures that were recently released. 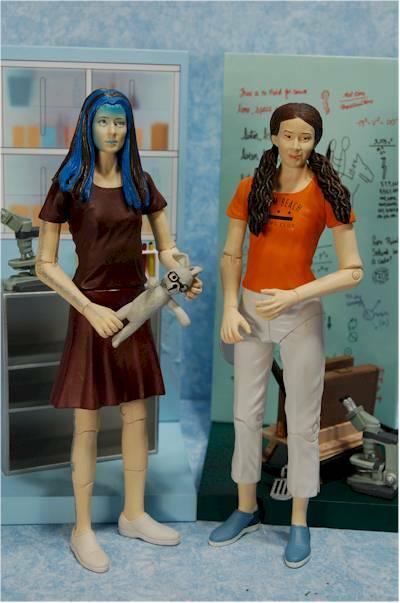 - and here's a couple of the Wesley figures, also from the Angel line. I'll also have a review of the 5 - yes, 5 - new Angel figures later this week.